The Theme Chooser lets you skim through an impressive collection of 30 new and updated Apple-designed themes. Once you’ve chosen the perfect canvas for your presentation, simply replace the placeholder text and graphics with your own words and images. 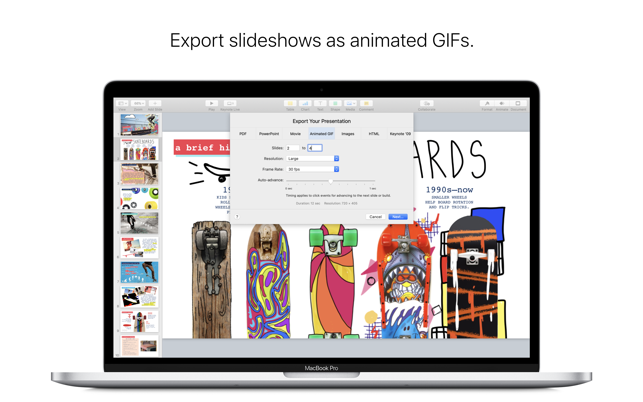 Easy-to-use tools let you add tables, charts, shapes, photos and videos to slides — and bring it all to life with cinematic animations and transitions that look as though they were created by your own special effects team. 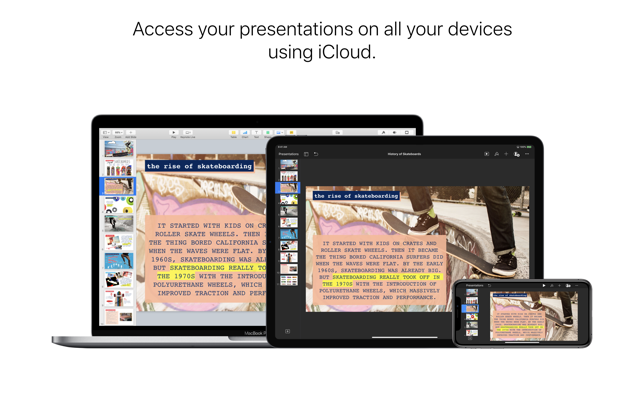 Use Keynote Live to present a slideshow that viewers can follow from their Mac, iPad, iPhone, iPod touch, and from iCloud.com. I have used this application every day for the past 5 years to do a variety of things. 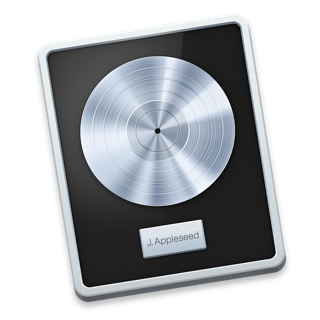 Not only is this software good for presntations but that is just touching the surface of what keynote is capable of. I use this software for practically all drawing and visual designing I do, not once have I needed to install expensive profesinal software for these things. I have also sucessfully used it for tehnical drawings and been able to actually physically cut designs made on keynote using CAM equipment. The software is also great with animation. 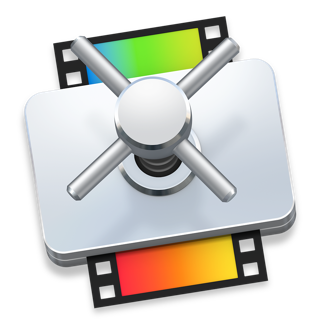 On its own iMovie is a limited video editor, however pairing it with kenynote allows many of features previously not included on iMove to be used. 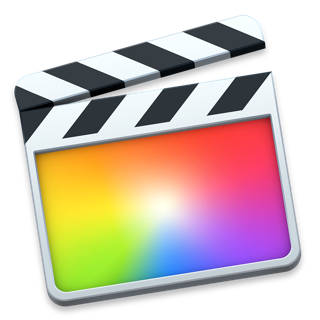 Combining these 2 apps has suited all of myvideo editing needs. Its overall simple non bloated intuitive interface has allowed me to make anything I wanted from form one application. How excellent. Keeps getting better for design work. 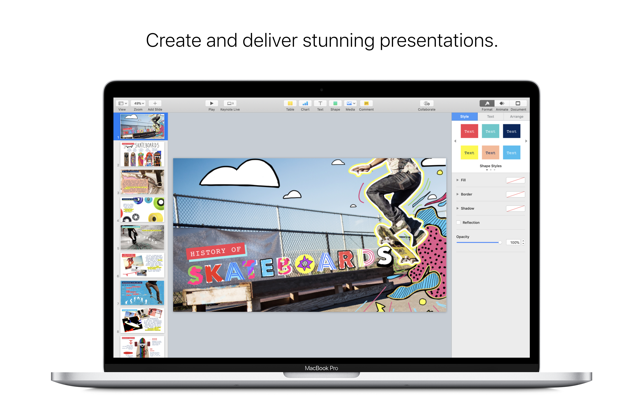 Keynote is my presentation software of choice. The themes are superior – clean and refined. I use it extensively to produce presentations for my classes, various digital artwork, Tinycards and animations. In addition I find Keynote to be a great tool for developing great looking posters and leaflets with relative ease. I gave my first Keynote Live presentation today, my students appreciated the ability to view the slides up close on their own monitors. And the Keynote Remote app functionality over Multipeer Connectivity framework makes remote presentation super easy. Lately I have not been impressed by Apple's trajectory even to the point of considering not buying another Mac. Keynote is a significant incentive for me to stick with Apple! Some new, good-looking, themes. 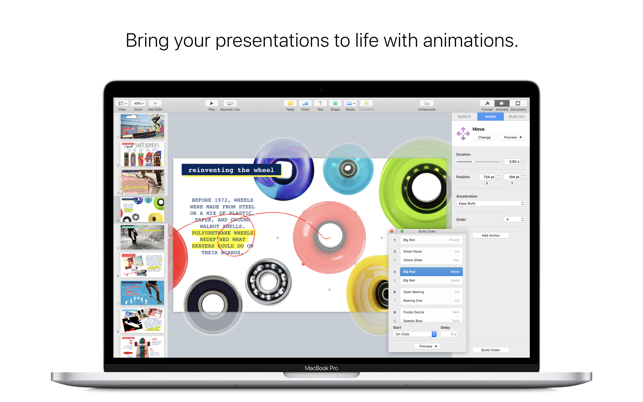 Interactive charts on keynote are fantastic, animate each transition – simply excellent. Animation Inspector is a big improvement. Choose between straightforward slide sizes (4:3 or 16:9) or customise the size by specifying dimensions in pixels. Animations occur in the browser – haven’t got them to work in IE or Chrome though. 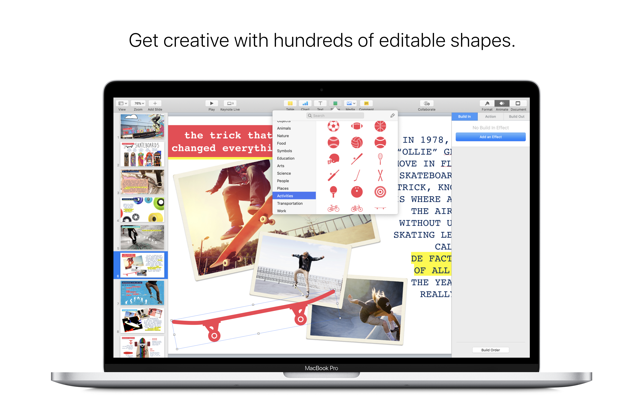 Hopefully Apple will roll out a way to embed Keynotes in websites soon. 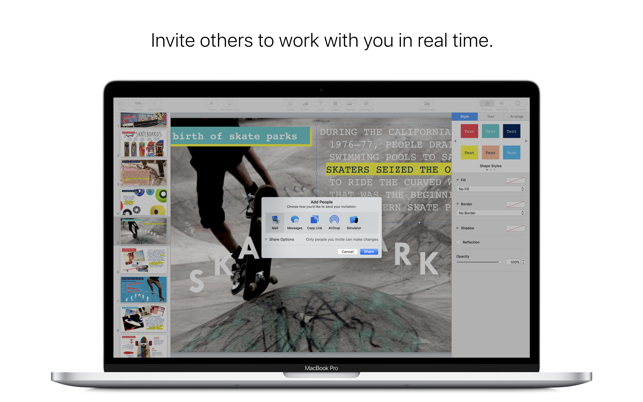 These are in addition to general iWork enhancements: integrated - contextual - Inspector, iCloud sharing and pinch to zoom to name the best. 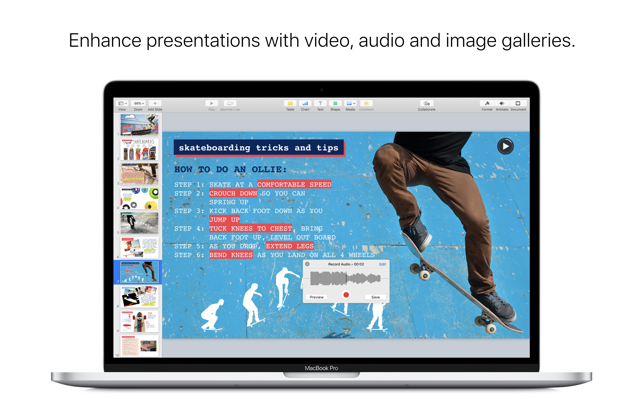 I never understand why anyone would use anything else for presentations if they have Keynote available. 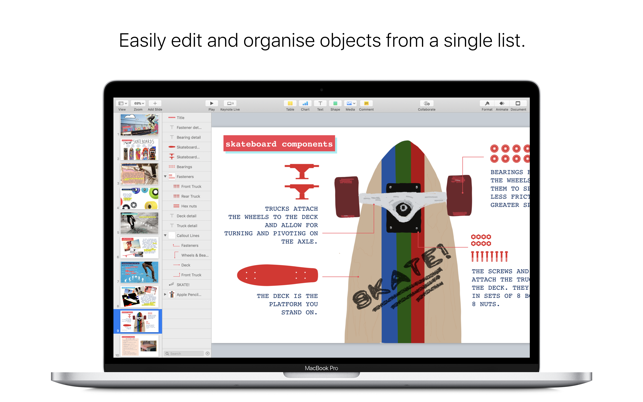 It's so much easier to use and can achieve such great things with only a couple of obvious clicks when PowerPoint needs a head-scratching dozen. I'm not knocking the alternatives, but I could never create the video animations and shows that I do, if I didn't have Keynote!